You are hopelessly addicted to Dice Masters, finding yourself playing at every opportunity possible. If you have already grabbed either the Marvel Dice Masters: The Uncanny X-Men Starter Set or Marvel Dice Masters: The Uncanny X-Men Collector’s Box, you have a fairly basic play mat to help you get through your games, the Collector’s Box having a better, more acceptable option between the two. 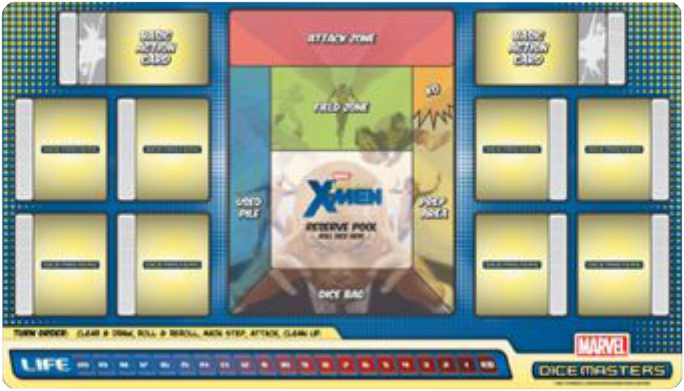 Now if you actually fancy yourself a Dice Masters player, its time to upgrade with an official Marvel Dice Masters: Uncanny X-Men Play Mat. The official mat is 24″ wide and 13″ long. What this means is that you have room to place everything you need for a game conveniently right on it. It has spots and room for up to eight character cards (meaning you’ll be all set for tournament rules), up to six of their dice right beside them, your two chosen action cards, a generously sized play area, and even a twenty point life meter scale on the bottom you can use a token with to keep track. When you are ready to jump into a game, this makes setup so much easier as well as just keeping track of all your character cards and die while you’re playing. One of the best features of the mat is that it is made out of neoprene. It has a solid feel to it like a mousepad, but easily roles up for storage. We were worried it might have problems laying flat after longterm storage, but surprisingly we have found very little to worry about in that regard. What we found helpful during actual gameplay is that the neoprene adds a bit of padding that will stop your dice scattering everywhere after you roll them. There still were occasional instances when a stray dice we rolled would end up bouncing off the table, but it was not nearly as bad as rolling them on the table itself. Is buying this play mat required for to get into Dice Masters? Absolutely not. Is it going to tremendously enhance your play experience? Absolutely. If you are going to be playing on a regular basis, this is an extra convenience item that you will want to own. Playing without compared to playing with it will make you wish you always had this around. In our own group of players, everyone wanted to own one after using it. Pick one up and you will most definitely feel the same.